NETWORK FINALS: THE GOLDBERGS gained 0.1 in final numbers. CABLE HIGHLIGHTS: ESPN’s NBA doubleheader was at the top of Wednesday cable with 0.99/0.85. On Comedy Central, SOUTH PARK dropped 0.07 to 0.61, and BROAD CITY ticked down to 0.31. VH1’s BLACK INK CREW held at 0.54, and MARTHA & SNOOP’S POTLUCK DINNER was up 0.04 to 0.31. TBS’s FULL FRONTAL edged up 0.02 to 0.42. Bravo’s REAL HOUSEWIVES OF NEW JERSEY ticked down to 0.41. On ID, HOMICIDE HUNTER jumped a tenth to 0.40, and UNUSUAL SUSPECTS was up 0.03 to 0.30. The 90-minute season finale of OWN’s QUEEN SUGAR rose 0.04 to 0.37, with an after-show special at 0.23. MSNBC’s RACHEL MADDOW SHOW led cable news at 0.36/0.55/3M, over Fox News’s HANNITY at 0.34/0.56/3.3M, and CNN’s ANDERSON COOPER 360 at 0.25/0.32/1.2M. On HGTV, HOUSE HUNTERS grew by 0.08 to 0.31, HOUSE HUNTERS INTL climbed 0.05 to 0.26, and PROPERTY BROTHERS was up 0.03 to 0.26. MTV’s ARE YOU THE ONE rose 0.04 to 0.28. E!’s TOTAL DIVAS gained 0.05 to 0.28. 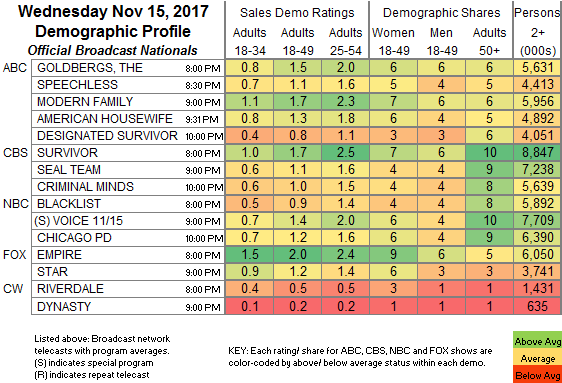 Discovery’s HOMESTEAD RESCUE returned at 0.28. USA’s MR ROBOT climbed 0.06 to 0.27. On Food Network, IRON CHEF SHOWDOWN ticked up to 0.23, and IRON CHEF: BEHIND THE BATTLE held at 0.18. 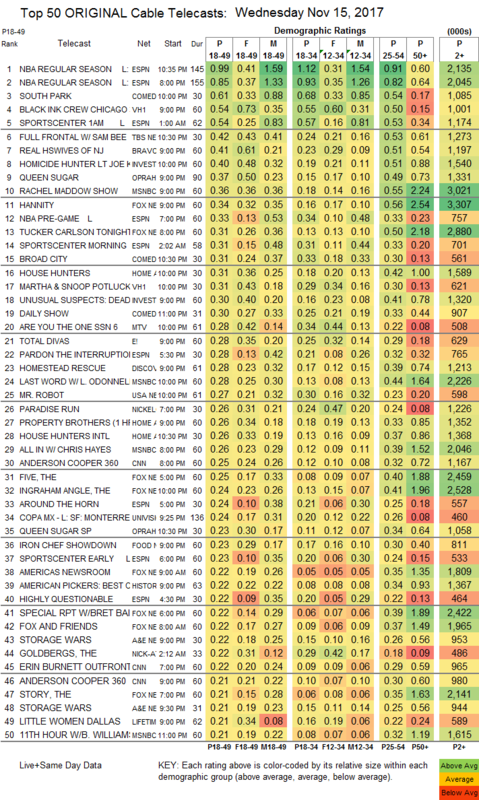 On A&E, STORAGE WARS was at 0.22/0.21, compared to last week’s 0.21/0.20, and OZZY & JACK’S WORLD DETOUR was steady at 0.19. Lifetime’s LITTLE WOMEN: DALLAS slipped 0.02 to 0.21. The back-to-back season finale episodes of FXX’s penultimate season of YOU’RE THE WORST were at 0.14/0.09, compared to last week’s 0.10. Spike continued burning off THE SHANNARA CHRONICLES at 0.12/0.10, slightly up from last week’s 0.09/0.08. On BET, FACE VALUE and 50 CENTRAL were at 0.08/0.07, down from last week’s pair of 0.10s. IFC’s back-to-back STAN AGAINST EVIL episodes were at 0.07/0.06, compared to last week’s 0.06/0.05. Sundance’s THE A WORD held sub-chart at 0.01/46K.